This highly visual brief survey of Western civilization presents an exceptionally balanced survey of the political, social, and cultural developments in Western history--both strengths and weaknesses, as well as the controversies surrounding it. The Teaching & Learning Classroom edition of the highly successful The Western Heritage, Tenth Edition provides your students with the most help available in reading, comprehending, and applying the material in the text and in class. A series of pedagogical aids within the text, in addition to presentational and assessment support for instructors, makes this text the perfect choice for those looking to make history come alive for their students. PART 1: The Foundations of Western Civilization in the Ancient World 1,000,000 B.C.E.–400 C.E. Early Civilizations to about 1000 B.C.E. The Bronze Age on Crete and on the Mainland to about 1150 B.C.E. The Greek “Middle Ages” to about 750 B.C.E. Competition for Leadership in the Fourth Century B.C.E. Compare & Connect: Did Caesar Want to be King? Imperial Rome, 14 to 180 C.E. Compare & Connect: Christianity in the Roman Empire —Why Did the Romans Persecute the Christians? Compare & Connect: Who Runs the World: Priests or Princes? Compare & Connect: Is the Renaissance Man a Myth? Compare & Connect: A Raw Deal for the Common Man, or His Just Desserts? Give students a foundation needed to study and enjoy history. 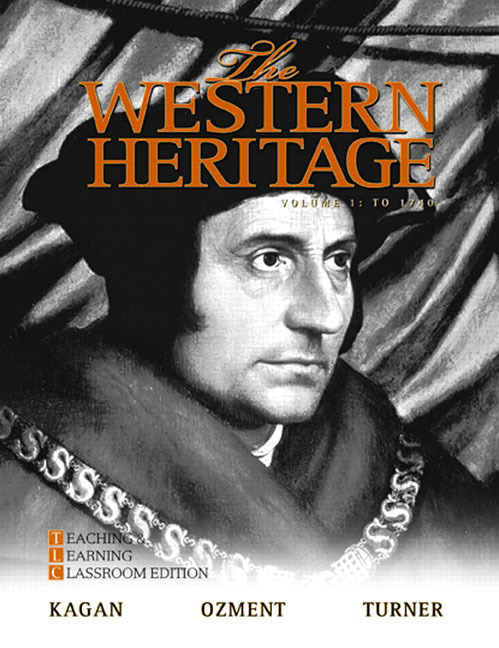 NEW– Introductory essay on the Western Heritage introduces students to the core values of the West. Emphasis on geographic literary - The maps in the Teaching and Learning Classroom Edition are easy for students to read and contain questions that ask students to consider the link between history and geography. Each chapter contains at least one interactive map, prompting students to explore the relationship between geography and history in a dynamic fashion. Chronologies, found in every chapter, place significant historical dates and events into a visual context. Complete and consistent pedagogy that takes an inquiry-based approach begins each topic by asking students a question to consider. Overview tables appear throughout the text to visually summarize important topics in the text. NEW–Compare & Connect features in each chapter present students with two or more documents reflecting opposing viewpoints on a controversial topic, engaging them to become part of the historical discourse. Each of these features contains three to five questions asking students to comment on each of the documents and to make connections between or among them. Encountering the Past features in each chapter provide a lively essay on popular culture, accompanied by an illustration and discussion questions. Subjects featured include ancient athletics, medieval games, diets, attitudes toward bathing, religious festivals, gymnastics in 19th and early 20th- century Germany, and the politics of rock music in the late 20th century–interesting historical topics that are certain to stimulate students’ interests. Chapter Review Questions–help students interpret the broad themes of each chapter. These questions can be used for class discussion and essay topics. Chapter opening questions — These questions enable students to keep in mind important questions to consider as they read each chapter. Marginal Glossary and Quick Review features recap important terms, events, and people in context. Enhanced visual presentation - one-column, visually refreshing format that is inviting to read. Donald Kagan is Sterling Professor of History and Classics at Yale University, where he has taught since 1969. He received the A.B. degree in history from Brooklyn College, the M.A. in classics from Brown University, and the Ph.D. in history from Ohio State University. During 1958—1959 he studied at the American School of Classical Studies as a Fulbright Scholar. He has received three awards for undergraduate teaching at Cornell and Yale. He is the author of a history of Greek political thought, The Great Dialogue (1965); a four-volume history of the Peloponnesian war, The Origins of the Peloponnesian War (1969); The Archidamian War (1974); The Peace of Nicias and the Sicilian Expedition (1981); The Fall of the Athenian Empire (1987); a biography of Pericles, Pericles of Athens and the Birth of Democracy (1991); On the Origins of War (1995); and The Peloponnesian War (2003). He is coauthor, with Frederick W. Kagan, of While America Sleeps (2000). With Brian Tierney and L. Pearce Williams, he is the editor of Great Issues in Western Civilization, a collection of readings. He was awarded the National Humanities Medal for 2002 and was chosen by the National Endowment for the Humanities to deliver the Jefferson Lecture in 2004. Steven Ozment is McLean Professor of Ancient and Modern History at Harvard University. He has taught Western Civilization at Yale, Stanford, and Harvard. He is the author of eleven books. The Age of Reform, 1250–1550 (1980) won the Schaff Prize and was nominated for the 1981 National Book Award. Five of his books have been selections of the History Book Club: Magdalena and Balthasar: An Intimate Portrait of Life in Sixteenth Century Europe (1986), Three Behaim Boys: Growing Up in Early Modern Germany (1990), Protestants: The Birth of A Revolution (1992), The Burgermeister’s Daughter: Scandal in a Sixteenth Century German Town (1996), and Flesh and Spirit: Private Life in Early Modern Germany (1999). His most recent publications are Ancestors: The Loving Family of Old Europe (2001), A Mighty Fortress: A New History of the German People (2004), and “Why We Study Western Civ,” The Public Interest 158 (2005). Frank M. Turner is John Hay Whitney Professor of History at Yale University and Director of the Beinecke Rare Book and Manuscript Library at Yale University, where he served as University Provost from 1988 to 1992. He received his B.A. degree at the College of William and Mary and his Ph.D. from Yale. He has received the Yale College Award for Distinguished Undergraduate Teaching. He has directed a National Endowment for the Humanities Summer Institute. His scholarly research has received the support of fellowships from the National Endowment for the Humanities and the Guggenheim Foundation and the Woodrow Wilson Center. He is the author of Between Science and Religion: The Reaction to Scientific Naturalism in Late Victorian England (1974), The Greek Heritage in Victorian Britain (1981), which received the British Council Prize of the Conference on British Studies and the Yale Press Governors Award, Contesting Cultural Authority: Essays in Victorian Intellectual Life (1993), and John Henry Newman: The Challenge to Evangelical Religion (2002). He has also contributed numerous articles to journals and has served on the editorial advisory boards of The Journal of Modern History, Isis, and Victorian Studies. He edited The Idea of a University by John Henry Newman (1996), Reflections on the Revolution in France by Edmund Burke (2003), and Apologia Pro Vita Sua and Six Sermons by John Henry Newman (2008). Between l996 and 2006 he served as a Trustee of Connecticut College and between 2004 and 2008 as a member of the Connecticut Humanities Council. In 2003, Professor Turner was appointed Director of the Beinecke Rare Book and Manuscript Library at Yale University.